KidKraft Paw Patrol Adventure Bay Play Table by KidKraft at Indsight. MPN: 980037522. Hurry! Limited time offer. Offer valid only while supplies last. Join Ryder, Chase and all their friends as they race to the rescue through the familiar sights of PAW Patrol Adventure Bay Play Table by KidKraft. Join Ryder, Chase and all their friends as they race to the rescue through the familiar sights of PAW Patrol Adventure Bay Play Table by KidKraft. The Lookout Tower features a working slide, elevator, rotating periscope and rotating base-just like the show. Each PAW Patrol member is included with a total of more than 70 pieces. 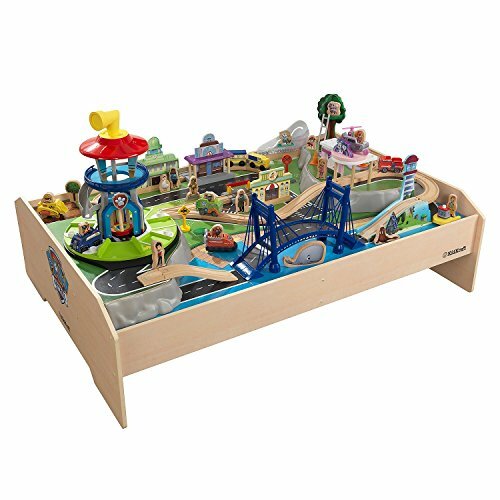 The play table's sturdy construction can handle even the most enthusiastic imaginations as kids build and rebuild Adventure Bay the way they want. Two movable plateaus and interchangeable tracks create endless combinations with KidKraft's other train sets. Product Specifications: Lookout Tower features a working slide, elevator, rotating periscope and rotating base. More than 70 pieces. Sturdy construction. 73 colorful pieces. More than nine feet of track. Rotating lookout tower with working slide.Movable plateaus for maximum creativity. Dimensions: 43.81" L x 31.49" W x 25.31" H.